With projected revenues of $60 million, the combination of creative thinkers, client-focused campaign solutions, and data-driven technology has proven to be a winning strategy for PostcardMania and their clients. The OutputLinks Communications Group had the pleasure to speak with PostcardMania founder and CEO Joy Gendusa and Vice President of Digital Printing Mike Custer to learn more about the company and the impact of their AccurioJet KM-1 UV Inkjet Press on production and client services. By the completion of this article, PostcardMania has decided to invest in a second AccurioJet KM-1 UV Inkjet Press. Over its 20-year history PostcardMania has served 81,767 clients in over 350 industries. The company has printed 1.8 billion postcards, delivered 82,673 marketing campaigns and mailed 705 million postcards for their clients. A 2016 investment in the Konica Minolta AccurioJet KM-1 Inkjet Press has been credited with accelerating the company’s high energy, fast-paced approach to delivering highly-effective direct mail campaigns. Two years later, PostcardMania invests in their second AccurioJet KM-1 Press. 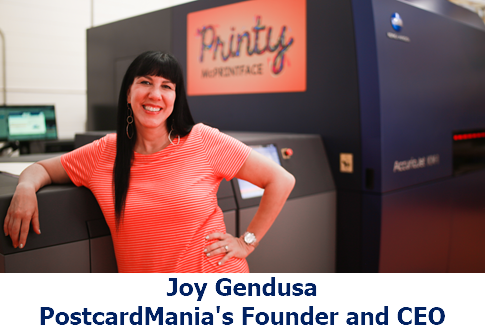 PostcardMania was born out of a terrible customer service experience Joy Gendusa had with a commercial printer. As a graphic designer who relied on direct mail to attract new clients, Joy was aware of the challenges small business people faced in trying to execute effective direct mail campaigns. Based on her personal experiences, Joy decided to launch a business to develop and print postcard-based programs for small and medium-sized businesses (SMB). “Even though I didn't have any experience as a printer or manufacturer I knew that I could provide a better product than what was currently on the market,” Joy recalls. PostcardMania started in Clearwater, Florida as the first nationwide all-in-one postcard marketing company offering design services, mailing list acquisition, mailing services, and printing. In the twenty years that have followed, the business has expanded those services to fully integrated online and digital marketing. The portfolio now includes personalized variable data printing, email marketing, website and landing page development, Google pay per click management, and social media management. Team members understand their vital importance to the company’s success and are caringly referred to as Maniacs. That is because they are maniacal about supporting each client’s success. PostcardMania’s “Meet the Maniacs” page and this YouTube video provide a peek into the company’s Maniac culture. The combination of a welcoming workplace, recognition, innovative technologies and successful client strategies landed PostcardMania on the area's Top Workplaces list five years in a row. “One of the most important policies I've ever put into place is our no office politics policy, which strictly forbids office gossip or negative chatter. Thanks to this policy, we have zero infighting, which ensures staff can focus on our clients and deliver the best service possible," Joy shares. "It makes all the difference in our quality of service and ensures we maintain a positive company culture." PostcardMania demonstrates their client commitment by hosting “Small Business Growth Summits” at their facility. These events bring together people seeking effective marketing solutions based upon connected, pervasive and persistent dialogs with customers and prospects. Attendees have an opportunity to learn from marketing experts and experience the technologies that transform ideas into highly effective marketing campaigns. PostcardMania print technology includes offset presses (nicknamed Seabiscuit and Elvis PRESSLEY) for static work and digital printers for the variable work. Variable printing was produced on toner-based digital printers until two years ago with the company’s investment in the AccurioJet KM-1 Press. That investment enabled PostcardMania’s clients access to the latest and best in variable data, personalized print technology. The first AccurioJet KM-1 Press investment in 2016 was a methodical business decision based upon client needs. Joy and Mike kept a close eye on both the SMB market and the maturing digital print technology. Joy recognized the SMB market was embracing the power of personalized variable data marketing. However, the cost of toner-based variable print was a challenge to the company’s small and medium business clients. As such, Mike began advocating for a stronger consideration of production inkjet-based digital print. Joy knew then the timing was right to get serious about inkjet print when she determined current client needs would be able to fill the inkjet device with net-new revenue. Now as they celebrate two years with their AccurioJet KM-1, their rapid growth has driven the need for a 2nd AccurioJet KM-1 Press. Konica Minolta helped launch and expand PostcardMania’s digital printing services in 2014 with toner-based printers. When the decision was made in 2016 to add digital inkjet, the AccurioJet KM-1 Press was already high on the list of options due to past experiences with Konica Minolta’s production printers, service and support. Despite past, positive experiences, the PostcardMania team approached the technology upgrade by thoroughly investigating all the available inkjet and B2 Press technologies. After evaluating the options, the AccurioJet KM-1 Inkjet Press was determined to be the best fit for PostcardMania’s growth objectives. 5. Print quality: Client campaigns were enhanced with the press’s exceptional color quality. “Konica Minolta is proud to announce the second anniversary of our production inkjet partnership with PostcardMania, headquartered in Clearwater, Florida. Joy Gendusa, Founder/CEO, Melissa Bradshaw, President, and their Executive Management Team have been fantastic to work with over the last two years,” said Bill Troxil, Senior Vice president, Strategic Business Development at Konica Minolta. “We at Konica Minolta have watched their business grow and prosper as one of the leading marketing service companies in the U.S.,” Troxil added. The AccurioJet KM-1 Inkjet Press unlocked a number of new opportunities in PostcardMania’s business. The speed and flexibility of the digital press support increased comingling of mail to reduce client postage expenditures. Variable data, color printing allowed faster set up of small quantity, on-demand print jobs. And, inkjet was a price-competitive alternative to toner-based color printing. Since postcards are embedded in PostcardMania’s name, the quality of the printed cards is critical. Before the AccurioJet KM-1, multiple, costly and time-consuming operations were required to ensure delivery of a high-quality, scratch-free postcard to a client’s targeted recipient. With the AccurioJet KM-1 UV Inkjet Press, those extra steps were eliminated and the time-to-market for client campaigns were drastically reduced. The recent addition of XMPie’s StoreFlow software continues PostcardMania’s commitment to providing SMB’s access to technologies and expertise equal to those available to large enterprises. StoreFlow provides an easy to use online storefront for clients to easily upload, order and track their campaigns 24 hours a day, 7 days a week. By integrating their two AccurioJet KM-1 Presses with client-based storefronts, PostcardMania is now positioned for its next wave of expansion. The goal is to provide franchise and related businesses, individualized, automated storefronts where they can execute direct mail campaigns printed at PostcardMania’s print facility. Clients will be offered online, data-driven portals where they can create and manage integrated, multi-channel campaigns utilizing the branded and approved marketing materials related to a franchise. The AccurioJet KM-1 Presses allow those materials to be printed and delivered quickly, competitively and with the highest quality. PostcardMania has grown dramatically over the past twenty years. However, Joy Gendusa and her team of Maniacs are just getting started at delivering the best in quantitative direct marketing results for their clients.